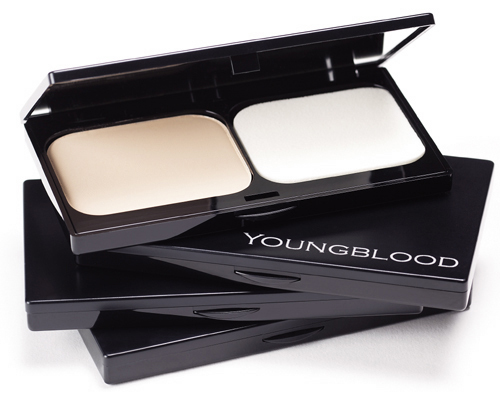 Youngblood’s oil-controlling Pressed Mineral Foundation provides exceptional concealing properties, while remaining lightweight and healthy for your skin. This special formulation includes rice starch to offer a smooth, matte look with a healthy, natural glow. The elegant, sleek black compact fits easily in your purse for a quick touch-up any time. When at home I prefer using brushes to a sponge. Use a small brush to conceal eye area, redness and any other blemishes. Use a large brush to get all-over coverage. Layer the applications until you get the kind of coverage you want. Loose Minerals are also available to be used with Rice Powder. Because there is more pigment in the Loose Minerals, it is a better choice than Pressed Minerals for very red, or blemished skin that needs extra coverage. The pigments Youngblood uses are very natural, no orangey jaw lines! Free of talc and fragrance, YB Mineral Makeup is incredibly silky, and provides sheer, high performance coverage and a natural radiance-without any glitter or shimmer. Mineral Makeup also offers some protection from UV – realistically, about an 8 SPF. It’s actually better for your skin to put Mineral Makeup on when going outside than just plain old bare skin. It lets the skin breathe, adds sun protection, and helps seal in moisture and seal out dirt, debris and pollution.